A lot of huffing and puffing and not a great deal of blowing your house down from Leinster last night at the RDS, when a misfiring home team took out a well-drilled, hardworking Scarlets outfit with the last kick of the game. It was difficult not to feel some sympathy for the Scarlets, because they were gamey, cliste and hardworking for the entire eighty minutes. A lot of teams have come to the RDS in recent months and simply rolled over; in their last five matches at the ground, Leinster have won by an average of almost 30 points [29.8] and have bagged four try-scoring bonus points. Still, at the moment it’s hard to feel too sorry for a Welsh team that loses by a penalty kick in the final moments of the match! The Scarlets are a very well coached side under Nigel Davies and Simon Easterby, and while they struggled somewhat in attack with George North, Rhys Priestland and JJV Davies absent, a great deal of credit for their dogged defensive performance should go to Easterby. We’ve long been huge fans of him at Mole Towers – Easter Rising was on the Christmas list [and lasted about an afternoon] – and his transition from club captain to defensive coach at the Scarlets has been absolutely seamless. The Welshmen [and the odd Fijian and Tongan] defended not just bravely but with a real degree of intelligence and cynicism, and while Nigel Owens certainly might have penalised them a little more often at the breakdown, in general they played the ref very well. That’s what you’ve got to do when you’re playing away from home. With that said, Leinster looked a long way off their best last night and, as Joe Schmidt admitted in a post-match interview, there was a degree of the home team ‘keeping Llanelli in it’. Handling errors were made at crucial times in attack in Scarlet territory, and poor decision-making abounded. While Fergus McFadden bagged all sixteen of Leinster’s points and put in a hard-working, physical performance, the players on either side of him – Ian Madigan at outhalf and Eoin O’Malley at second centre – hardly set the RDS alight. O’Malley struggled to work his way into the match, while all the worst aspects of Madigan’s underdeveloped kicking game were on display. Dev Toner - he didn't get on the score sheet tonight, but had a very busy day carrying the pill on his way to winning the 'Stadium MVP'. Next stop, Disneyland. 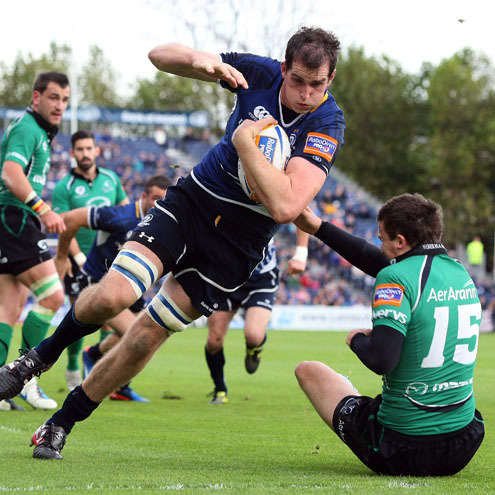 However, on the positive side of the ledger, Devin Toner had another big game up front and carried a hell of a lot of ball into contact – probably the best ball-carrying performance he has put in for Leinster, and against a good defense, too. Big Dev is having a monster season: he has played in twenty of Leinster’s twenty-one competitive matches [starting sixteen of them] and has played more minutes  than anybody else in the squad bar Isa Nacewa . Due to his size and build, he was always going to be a long-term project in the RDS, and at 25 years old, he’s really beginning to hit the straps. Apparently he won the “Stadium MVP” with captain-for-the-day Kev McLaughlin taking home TG4’s “Fear An Chluiche” … doubtless there were more prizes around for anybody who felt left out. The “I Can’t Believe It’s Not Butter Substitute of the Night” award was another one up for contention, with excellent performances off the bench from Richardt Strauss, Heinke van der Merwe and Leo Auva’a – all three were significant improvements on the starters. Strauss’ excellent work at the breakdown is a well-known factor of his play, and it was he who won the last turnover that led to McFadden’s game-winning shot at the sticks. 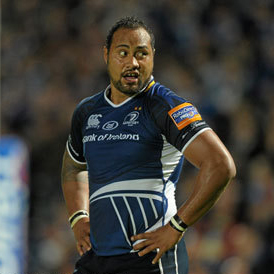 Leo Auva'a - from Old Belvedere groundsman to Pro12 star, the big No8 has been a great addition to Leinster's squad this season. He left his trademark stutter-step in the changing rooms and came out to blow some holes in the Scarlets defense in the second half. From the Mole’s point of view, however, Auva’a was the outstanding substitute. 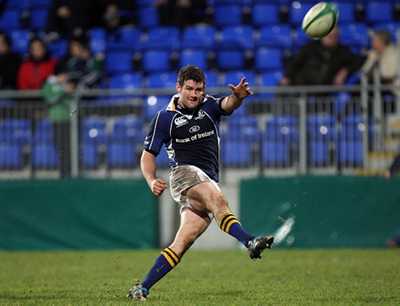 He was introduced into the game through a slightly circuitous route: Damien Browne was replaced at half-time [having suffered from illness during the week, apparently], with Kev McLaughlin moving from blindside to second row, Rhys Ruddock moving from No8 to blindside and Auva’a coming off the bench into No8. The big man had a big second half with the wind at his back, constantly putting Leinster on the front foot and skittling defenders. Leo has been an inspired pick-up from Old Belvedere this season, playing in all bar one of Leinster’s Pro12 games; when Jamie Heaslip and Sean O’Brien are missing from the team, he gives that go-forward, tackle-breaking ability that Leinster need to really prosper. With the Scarlets defense playing Madigan well by fanning wide and then closing down the space from outside in – thus depriving him of his favored cut-out passes – there was always going to be space behind the ruck for a big runner if he could break the first tackle. It was a reasonable night at the scrummaging office for 22 year old Jack McGrath at loosehead and 24 year old Jamie Hagan at tighthead. McGrath was up against Fijian World Cup captain Deacon Manu and held his own for the guts of an hour, which is no small achievement, and once again Hagan had a satisfactory performance in the scrum and a couple of good bits and bobs in the loose. It’s easy to take a solid scrum for granted, so maybe a little more credit is due to the two youngsters. This entry was posted in Match Reaction and tagged Devin Toner, Fergus McFadden, Leinster, Leo Auva'a, RaboDirect Pro 12, Scarlets, Simon Easterby by dementedmole. Bookmark the permalink. 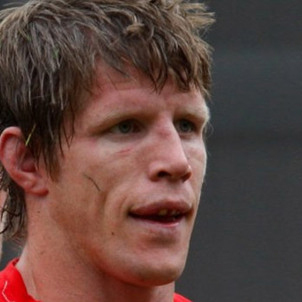 The scarlets have a good side and (with Owens’ help) they made life tough. Every day is a school day and last night was a big school night for madigan. He probably was guilty of going a little too wide, too early, too often. The ball could have been kept a bit tighter for longer, which might have given o’malley a touch more room, but I gotta say when madigan gets her, the rds buzzes. His development this year has been a highlight of the season. I know he got little return from the kicks, but his technique and ball strike have improved immeasurably. On another night he will get better results. Agree totally about Toner, big leo and about Strauss (who was also pinged for what was a great steal), but whatever about man of the match, moment of the match (sponsorship available) has to go to mclaughlin. His hit and turnover for a leinster penalty (maybe 40 m from scarlets’ post in the first quarter)……mighty stuff. McFadden’s getting a bit of a hard time on the Leinsterfans website for his performance on Friday night – aside from the falcon in the Scarlets’ 22 [and a couple of non-vintage, but not horrendous passes] I thought he had a decent game. Brings a lot of explosiveness and quickness to the midfield. If he could work on getting some passes away in contact, he’d really be in pole position for the No12 jersey. Couldn’t agree more mole. People criticising mcfadden are not giving due credit to the lanelli defence (as you’ve already commended), which spread out and cut down the space. This is what allowed Leo to come on and do so well, getting some mileage going up the gut/quarterback sneak. Nobody could have done anything out wide. Are people having a go at nacewa? because even he found it equally tough to make an impact and we all know how good he is. McFadden is definitely getting “there,” probably the closest of that promising midfield trio. People are a little carried away, expecting to tear it up week in week out anyway. It is to leinster’s credit that they are managing to keep their feet on the ground and grind things out, especially given the low penalty count for them. I saw nothing in the ruck for the match winning penalty incident that the scarlets hadn’t been doing for much of the game.